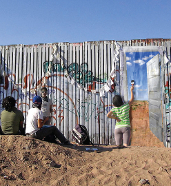 Beyond Walls and Cages: Prisons, Borders, and Global Crisis, an anthology of articles by a mix of some 40 activists and academics published in December 2012, is a serious effort to take the discussion on immigration outside its prescribed limits. Unlike most treatments of the topic, the book questions the basic concepts and considers immigration policy historically and in relation to incarceration policies and neoliberal economics. Most importantly, the contributors discuss ways to talk about these issues with a broader public. Beyond Walls and Cages: Prisons, Borders, and Global Crisis. Jenna M. Loyd, Matt Mitchelson, and Andrew Burridge, editors. University of Georgia Press, 2012. Paperback, 344 pages, $24.95. Immigration reform is back on the U.S. political agenda this year, and with it the mainstream’s carefully scripted “immigration debate.” Once again we hear about the need to “secure our borders” and “enforce our laws”; once again, commentators endlessly repeat the word “illegal.” Through it all we act as if terms like “border” and “illegal” express self-evident and eternal truths on which we all agree. This year, though, the politicians seem a little worried. Brendan Buck, a spokesperson for House Speaker John Boehner (R-OH), has even expressed a concern that President Obama “might drag the debate to the left.” Although there seems little danger of that, people’s perceptions have changed in many ways since the last big push for immigration reform, in 2007. The rigidly controlled “debate” about economic policy was shaken up in 2011 by the Wisconsin labor protests and then by Occupy Wall Street; the climate “debate” was violently disrupted in 2012 by the aftermath of Hurricane Sandy. Could something similar happen with immigration? 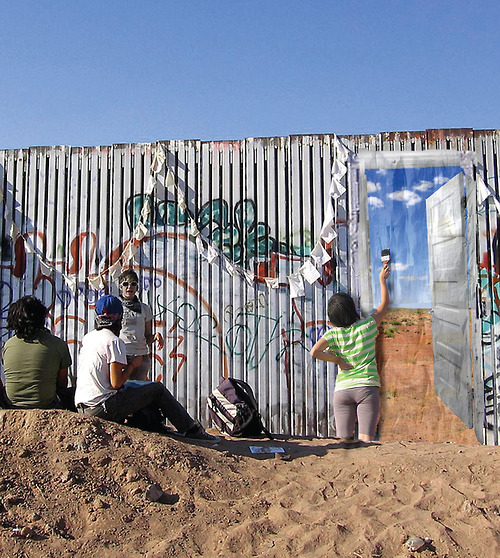 Beyond Walls and Cages: Prisons, Borders, and Global Crisis, an anthology of articles by a mix of some 40 activists and academics published in December 2012, is a serious effort to take the discussion outside its prescribed limits. Unlike most treatments of immigration, the book questions the basic concepts and considers immigration policy historically and in relation to incarceration policies and neoliberal economics. Most importantly, the contributors discuss ways to talk about these issues with a broader public. What, after all, is a border and why should it be illegal to cross one? Borders are the result of specific historical processes. The border between Mexico and the United States was established by a war of conquest in the 1840s and—as University of British Columbia professor Margo Tamez, a member of the Lipan Apache Band of Texas, notes in her contribution—by the brutal suppression of the region’s original inhabitants. The legality or illegality of crossing a border is usually a simple matter of economics. People born in “relatively rich and stable nations” generally travel between countries with no trouble, Vassar geography professor Joseph Nevins points out in the first chapter, while people from poorer countries often become “illegals” and lose even “the right to have rights” when they cross a border. But double standards and accidents of births are also crucial to understanding illegality within nations, as Columbia University faculty fellow Laura McTighe shows in her contribution. As of 2009 some seven million U.S. citizens were in prison, on parole, or on probation in their own country. African Americans and Latinos made up the majority of this population. An astonishing 35 percent of African-American men between the ages of 25 and 34 fall in this category. If any doubt remains that conventional perceptions of borders and criminality are largely arbitrary and often racist, there is the example of Operation Streamline. While U.S. immigration law treats being in the country without legal immigration status as a civil violation, like a parking ticket, “entry without inspection” (immigration jargon for unauthorized crossing of the border) is a misdemeanor punishable by up to six months in prison. This law is virtually unenforceable: arresting, trying, and imprisoning the millions who have “entered without inspection” would quickly bring the federal justice system to a halt. But in 2005 the administration of George W. Bush decided to show it was “getting tough”: the old policy of releasing unauthorized Mexicans and Central Americans caught crossing the southwestern border was replaced with a policy of prosecuting them on the misdemeanor charge. A chapter by the Arizona-based Borderlands Autonomist Collective describes how this policy plays out each day in the DeConcini Federal Courthouse in downtown Tucson. A group of men and women are led into the court, “shackled and cuffed,” wearing “grunge and sweat from days spent crossing a remote and barren desert.” In what attorneys have called “assembly-line justice,” they waive their right to a trial, plead guilty to entry without inspection, and receive prison sentences of up to 180 days. The defendants’ chains make “a constant clatter throughout the proceedings,” the collective writes. The number of “criminals” produced in Tucson is usually not more than 70 a day. Hundreds of border-crossers are caught each day in the border’s Tucson sector, but the court can’t handle more. So these 70 immigrants spend up to six months in jail and are tainted with criminal records because they are Latin Americans, because they crossed an arbitrary line defined by a contemptible 19th century war, and because they were needed to fill a quota for what is essentially a political show trial. Of course racist and arbitrary laws are nothing new. But there’s an historical dynamic as well. The number of undocumented immigrants has increased dramatically since the 1970s, as have the enforcement measures directed against them. At the same time, as McTighe points out, the number of people, mostly native-born, held in prison has also increased—by 500 percent since 1980.There are now about seven million unauthorized immigrants of working age, more than five million citizens on parole or probation, and millions more with prison records who are effectively disqualified from most jobs, as well as from social safety net benefits such as food stamps. In other words, a significant part of the country’s potential workforce—probably about 10 percent—is made up of people with a compromised legal status. Clearly the startling growth of a vulnerable, easily exploited underclass of potential workers over the past 30 years fits in well with the neoliberal economic policies that have dominated the same period, especially with the drive by businesses to roll back the gains that labor made in the 1930s and African Americans made in the 1950s and 1960s. In an interview, Ruth Wilson Gilmore, a City University of New York geography professor who writes on prison issues, describes how this process played out with janitors in Los Angeles. The janitors, mostly African-American men, were unionized and had “fought and fought and fought to secure their jobs, wages, and benefits,” Gilmore says. But in the 1980s companies began laying them off and outsourcing to contractors who hired undocumented immigrants at less than half the pay. This doesn’t mean that the criminalization of immigrants and African Americans represents a vast neoliberal conspiracy to drive down wages. The actual process is more complicated; many people are sincerely concerned about drug use and the sharp rise in undocumented immigration. But the effect remains the same: the creation of a marginalized underclass with a reduced ability to make demands for higher wages and better working conditions, for decent education, affordable housing, healthcare, and social services. And this effect spreads beyond impoverished communities of color, accounting in part for the overall stagnation of wages over the past four decades and for the economic inequality that damages our society in so many ways—and only benefits the super-rich. If these policies are so harmful to the majority of the population, should it really be impossible to win that majority over to a deeper and more radical understanding of borders and prisons? A last-minute attempt by the Arizona Prison Moratorium Project (APMC) to oppose plans for building an immigrant detention center in Arizona’s conservative Cochise County was less successful, but as Prescott College faculty member Zoe Hammer writes, one brief intervention at a county board of supervisors meeting was enough to win some sympathy from local business owners and to get one of the three supervisors to change his vote. Unfortunately, some of the contributors make their ideas less accessible to the general public by slipping into the language that academics use to address each other. And the book would be more convincing if there were more discussion of immigrants in the workplace. The massive May 1 demonstrations in 2006 were the largest immigrant protest in U.S. history, but they were probably also the largest labor action. Some of the most exciting developments in the labor movement right now come from native-born and immigrant low-wage workers organizing together. “We have a big battle on our hands,” Gottlieb says in her interview. Beyond Walls and Cages moves the process forward, but there’s a lot more we need to do.